Shanghai DE Printed Box is a leading China custom paper bag manufacturer, supplying the various custom luxury paper bags like custom garment bags, shopping bags, cosmetic bags, kraft bags and various printed paper bags. Embossing, debossing, spot UV, hot foil stamping, UV varnishing, glossy, matt laminating and varnishing are available. DE focuses on the supplying and manufacturing luxury paper bags for garment, cosmetics, wine, gift... All the bags are custom made and exquisite. We study the paper materials, the printing methods, and the finish to give our clients the most satisfying printing effect and feel. Our bags impress people. Art paper, solid bleached board, kraft paper are commonly used to make the paper bag. Art paper are widely used in the advertising sector, because it gives the high printing quality. The color of the original picture can be accurately reproduced on the paper bag. There are gloss art paper and matt art paper based on the finish. The solid bleached board, also called ivory board, are thicker coated paper with the grammage higher than 160gsm-180gsm. It has the better printing quality than art paper, and more durable. While kraft paper bag are used when people has a high requirement for the loading bearing, and a not high requirement for the advertising effect. For the paper bag rope, there are cotton string, twisted string, PP string, Silk String, PP webbing robe, ribbon, PVC tube, twisted paper string and leather rope. Note: All the paper bags below are just for your reference. Your printed bags will be custom made based on your artwork and packaging need. In DE, for the paper bag production, we adopt the standard bag style and use the paper bag making machine to make and print the paper bag on the flow line. Thus we can finish the mass production soon within 1 or 2 weeks even if the order quantity is tens of thousands of. Also the unit shopping bag costs is reduced too. 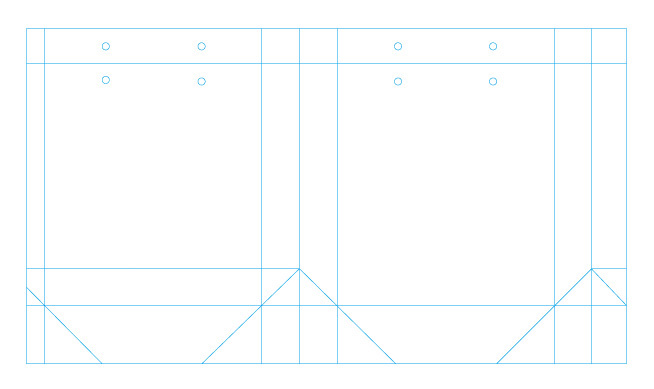 The first image below shows you the standard dieline and layout for the paper bag mass production. The second picture shows you how you give us the size of the paper bag so that nothing is wrong during the mass production. Shanghai DE Printed Box supplies the free custom paper bag dieline template. All you need do is to email us the dimension details of your paper bag as below. Shanghai DE Printed Box is an export-oriented custom luxury paper bag manufacturer with over 10 years' experience in the package industry. Our products are produced by following the international standard, like ISO 9001, ISO 14001, SGS, BV. Check the list before if you would like to import the paper bags from us to reduce the costs. Price: Base on your order quantity and need details. Turn Around Time: Usually 1-2 weeks. Packing: Double wall corrugated carton, pallet, as per your request. Sample Making: 100-150USD(delivery fee included). Shipment: By sea, by air, or by courier like UPS, TNT, DHL and Fedex. In order to quote you an accurate price, your artwork and sample bag are always preferred, particularly the sample bag. Just email at kris@deprintedbox.com to get a price quote now. This post is a complete guide for business owners, packaging buyers and marketing directors who need purchase the RIGHT paper bags. When it comes to ordering a paper bag, you need set your target first. This is essential for you to choose the right materials, print design and finish afterwards. Surely you won't pick the plain kraft paper materials while you want to promote your brand if you own a fancy fashion clothing boutique. To know your target, just ask yourself this simple question. What functions would you like the paper bags perform for you? The paper bag usually has two primary functions, carrying and marketing. Paper bag help customers carry items easily and conveniently. Also it is a great marketing tool for business owners to increase their brand recognition, which opens new window to opportunities. So which one is your priority? If you just want to make your customers carry the products easily, it is the strength and durability that you need focus. It would really be a shame if the wine bottle falls out of the bag and breaks just because the bag is not strong enough. Usually a plain kraft bag would be ok. However, things will be quite different if you need a high impact paper bag to promote your brand and leave consumers a deep impression. You need take all factors into consideration, including handicraft details, paper materials, rope handles, print design as well the finishes. A little mistake can have a disastrous effect. Before you have a print designer create the print design for you, you would better ask your printer if they can create a dieline for you, then you can let the graphic designer put the print design on the template. In China, most manufacturers are reluctant to provide the free dieline because they scare that you give the order to some other printers after you finish the dieline. They usually will let you put a deposit of 100-200USD and promise to give you 3-5 pieces color printed sample bags after the design is finished. In DE Printed Box, we provide our customers the accurate and applicable template without any charges ahead, because we believe that the good long-term business should be built on the mutual trust. When you let a printer create the template for you, be sure to specify the length, width and height of the paper bag correctly. A mistake in the size specification can lead to frustration and a terrible waste of time for both. 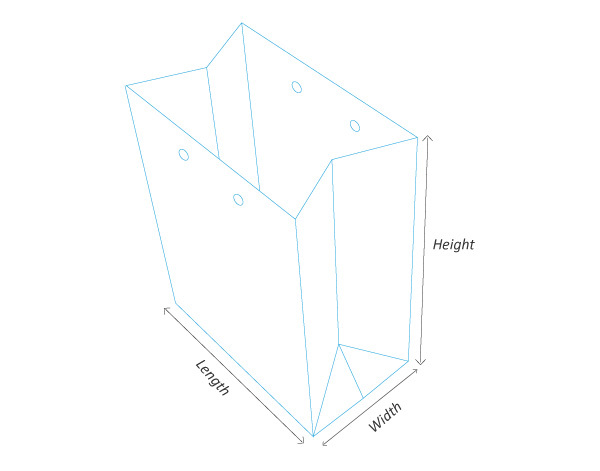 In China, the size is usually specified in the order Length x Width x Height, which is illustrated by the image below. With respect to the print design of the paper bag, knowing the difference between the general graphic design and print design is quite important. Particularly for the long run printing, it may save you tens of thousands of dollars. The web design adopts the RGB mode while it is CMYK color mode for the printing. A pretty image design created with the RGB mode can have a fantastic display on the computer. However, it may look quite ordinary when printed on the press. It is because the RGB mode has the wider color range than the CMYK color mode. Refer to the post below to learn more about the color space for RGB and CMYK color mode. In one word, the professional designer knows how to choose the safe colors within the CMYK color space to create the appealing design and how to reduce the costs by using solid colors instead of the process colors. A print designer makes the whole printing process go more smoothly. When the artwork is finished off, the PDF format is preferred, which represents the most universal adopted standard today. In addition to the format, be sure to outline all the texts in the artwork in case there is any special fonts involved to create the design. If the printer's computer lacks this font, the texts will be displayed quite weirdly, which makes the printer's life quite hard. About the font issue, some designers may have a different opinion, insisting that a PDF format is enough. And the Adobe Acrobat can display the text quite well even if the text is missing. However, who knows the printing better than the printer? You would better listen to the advice of your printer. Sometimes, an outlined artwork is completely imperative when the artwork is terribly created mixing the print design with the dieline together. It may become the printer's nightmare when the designer has nothing to provide but a JPEG image with very low resolution. Gorgeous paper bag begins with the right paper material that will deliver performance, quality and dependability for the product it holds and carries. Whether it be an exquisite shopping bag with the prominent spot UV varnished logo or a plain brown Kraft food bag, choosing the proper materials is critical to the marketing and visual effect. How do we choose the proper paper materials? Three types of paperboards are mostly used in the paper bag printing, SBS C1S ( Solid Bleached Sulfate, coated on one side), CUK ( coated unbleached kraft paperboard) and specialty paper. In Australia, Hong Kong and China mainland, the C1S SBS is often referred to as the ivory board or art paper. And the art paper is slightly different from the ivory board. In the United States and Canada, people prefer to use the term C1S SBS. We will use the term art paper in the description below. One typical specialty paper is the black specialty paper with the matt black color. With either silver hot foil stamping or the spot UV varnishing, the paper bag made of this paper looks really gorgeous with a luxurious quality feel. Once before, we helped ProspektSupply in Canada produce a very unique luxury paper bag. We printed the logo (ProspektSupply) in black color and applied the spot UV varnishing on it, which turned out great. Also we use the black specialty paper to produce the paper bag for a well-known bank in China with the silver hot foil stamping for the texts, which looks terrific too. Besides the black specialty paper, there are actually a lot of types to choose with various patterns and texture. Usually the more prestigious the packaging bag, the thicker the paper. Also the grammage and thickness of the paper material have a huge impact on the bag's endurance. Usually 157gsm (6-8pt), 210gsm (10-11pt) paper is recommended for the paper bag. And 300gsm (15-17pt) or above art pape can be used when a heavy duty packaging and carrying bag is in need. The units to represent the paper grammage and thickness are quite confusing. People in China, Australia would like to use the grammage to measure the paper thickness, while the unit pt is used in North America. We have published a post in our blog before to illustrate the conversion between the pt and grams. You can learn more there. The handle plays an important role in the bag's performance, aesthetically and functionally. With a good handle, the paper bag can be used for months to a year sometimes thanks to its amazing endurance. There are usually two types of handles are used, the grosgrain ribbon handles and the rope handles. For rope handles, 3 types of materials are mostly used, the nylon, cotton and the paper. Among these materials, the nylon has the best durability and endurance; the cotton rope handle is the most popular handles used for the paper bag, which has the most wonderful touch in hand; and the paper rope handle can make the paper bag like a piece of great artwork with the help of the top packaging designers. With respect to the price , the nylon usually costs more than the paper. The cotton handle is the cheapest at around one cents. Generally, the cotton rope are mostly used which has the best hand feel. Besides, when the paper bag is particularly big, we need use the rivets to fasten the handles to the paper bag. The printing finish adds a luxurious quality feel, turning the ordinary paper bag into an extraordinary artwork. The laminating makes the paper bag water-proof and more durable. With the glossy laminating, the paper bag will look very shiny, clear and eye-catching. The matt laminating gives the paper bag a very smooth and soft texture, looking more elegant and luxurious. In the mean time, the spot UV, hot foil stamping, embossing and debossing can also be used to produce an upscale paper bag. Every finish can have a splendid effect on the paper bag if they are used in the right context. Therefore, each finish is just different but no less at all. DE Printed Box is a professional paper packaging products manufacturer, which can provide you the best packaging solution with the upscale and luxury feel. Email at janewu@deprintedbox.com to learn more.